β-Blockade Therapy in the Perioperative Period: Is There Convincing Evidence? 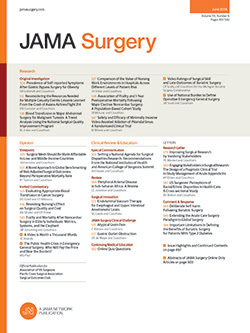 Notwithstanding the several inherent limitations of any retrospective review (including omissions, miscodings or other inaccuracies, potential for selection bias), the study by Richman et al1 in this issue of JAMA Surgery reflects an enormous effort by the authors to analyze a large patient database to assess and measure the adherence and outcomes of β-blockade continuation according to the Surgical Care Improvement Project (SCIP) and the revised SCIP criteria. Since the initiation of the SCIP, specific best-practice metrics have become measurable standards of care. Despite its widespread acceptance and use, the merits of β-blockade in the perioperative setting have been inconsistent based on multiple investigations. Unfortunately, the article “Improved Outcomes Associated With a Revised Quality Measure for Continuing Perioperative β-Blockade” demonstrates, again, the lack of understanding with respect to β-blockade therapy and the associated risks and benefits when use occurs during the perioperative time line.